Most of us learned how to brush our teeth in Kindergarten—so it’s no wonder we tend to get some things wrong. After all, we haven’t had a proper tooth brushing lesson since we were little kids! Coupled with the fact that tooth brushing best practices have changed over the years, and popular myths that exist about dental hygiene, it’s not surprising that so many people visit our office with cavities and caries, even though they brush every day. Here are some ways you may be brushing your teeth wrong. Myth 1: After brushing your teeth, you should rinse out your mouth with water. This is by far the most common tooth brushing mistake most people make. When we were kids, an emphasis was placed on spitting out the toothpaste in order to keep us from swallowing it. However, as an adult, you should keep the toothpaste residue on your teeth as long as possible. Toothpaste works by applying fluoride to your tooth’s surface, in order to raise the Ph of your mouth and remineralize the enamel. Rinsing it off with water minimizes its benefits. Myth 2: After brushing your teeth, you should rinse your mouth with mouthwash. Mouthwash should be used before you brush, not after. Unless it’s a fluoride mouthwash, you’ll be negating all the hard work you did by brushing, just as with water. Secondly, you’re also creating a more acidic environment in your mouth that wears your enamel down more quickly. Myth 3: You should brush your teeth soon after eating. Brushing your teeth after a meal does a lot of damage to your teeth. All the acid in your food is stuck in-between your teeth, and brushing rubs it around like sandpaper. Instead of brushing directly after eating, wait a few hours after eating so that the saliva in your mouth lowers the Ph. If you’re worried about having bad breath, chew a minty gum containing xylitol. The best time to brush your teeth is first thing in the morning, before you’ve eaten. Myth 4: Since plaque is tough to get off, I need to brush forcefully. Brushing too hard can actually cause your gums to recede, and erode your enamel as well. Instead, brush your gums with light, gentle motions. Plaque is not stuck on hard to your teeth, and brushing lightly will remove it. If your toothbrush bristles have a smashed-down appearance, that’s a sign that you are brushing too hard. If it’s been a while since your last dental cleaning, be sure to stop in to Hansen Dentistry. Our Apex dentist office is a welcoming, family-friendly, judgement-free zone where we only care about one thing: helping you have the healthiest smile possible. To schedule an appointment, fill out our appointment form here. Though inconvenient, a dental emergency is not something you want to ignore. However, you should know the difference between a true dental emergency and a situation that can wait at least for the night. Dr. Rylan Hansen and his team at Hansen Dentistry in Apex, NC are here to provide expert emergency dental care should you ever be in need of immediate treatment. Contact us at (919) 363-8444 to schedule an appointment. Often, a tooth will break, chip or crack because you bit something hard, such as ice cubes, an apple or hard candy. Opening chip bags, plastic containers or “easy open” pill bottles with your teeth can sometimes result in the same thing. Some dental emergencies are the result of a traumatic injury or accident. Children can fall on the playground or get hurt at practice or you could be involved in a car accident. If the injury is just a chip or minor fracture, you could decide to wait and seek attention when the dental office opens. However, a severe injury is a different story. Here are some things you can do if you (or your child) sustain a tooth injury. Cracked tooth – See the dentist as soon as possible, especially if there is any pain. Even if the tooth looks “okay” you should still be cautious. If the tooth hurts when you drink something hot or cold come in right away, as it could be a sign of nerve damage within the tooth. Another sign of a crack is if the tooth hurts after you release your bite. Broken tooth – There is usually no mistaking a broken tooth. If there is a large fracture, chip or part of the tooth is missing see the dentist ASAP as there could be nerve damage. If there is bleeding, apply pressure with a small piece of gauze. If the bleeding won’t stop, try using a wet tea bag. Put a cold pack or ice on your lips or cheeks over the area of the broken tooth to reduce swelling. If you absolutely can’t get to the dentist right away, cover the tooth with temporary dental cement from a drugstore. Tooth is knocked out completely – First, try to put the tooth back in the socket. If it will not go back in, clean off the tooth as best you can and store it in a sealed container with milk or your saliva. Apply a cold compress if there is any bleeding. If you develop sudden – or suddenly increased – tooth pain, see the dentist as soon as you can. It could be a sign of tooth decay or damage to the nerve. You can probably wait until normal hours to go in, although it might feel like an emergency if the pain is severe or it hurts when you try to eat or drink. Tooth pain can interfere with your ability to eat, drink, work, sleep and even think. A cracked, broken or missing tooth constitutes a real emergency that requires care as soon as possible. Dr. Rylan Hansen and his team at Hansen Dentistry in Apex, NC are here to help, with extended hours, same day emergency appointments, and Saturday appointments. Even if you are not in pain from a cracked or lost tooth, it is still important to come in as soon as possible. The first several hours can mean the difference in saving your tooth. If you ever need emergency dental care, contact us at (919) 363-8444 to schedule an appointment. So you have a tooth that has a cavity and needs a filling. Now what? Most people know that the two most common options are tooth colored fillings (called composite fillings) and silver fillings (called amalgam fillings). 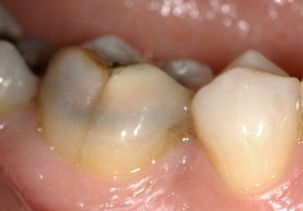 And most people would agree that the composite fillings are much more aesthetically pleasing than the amalgam fillings. Some patients prefer not to have amalgam fillings because they contain mercery. However, it is important to note that ongoing scientific studies conducted over the past 100 years continue to show that amalgam fillings are not harmful. Sometimes the aesthetic outcome is reason enough to choose a tooth colored filling, especially when the tooth is one that is visible when the patient smiles. But there are other important reasons that most Apex Dentists these days are choosing to use tooth colored composite fillings rather than amalgam. And these reasons have to do with the major difference in the way they are placed in the mouth. Composite fillings are resin-based and are chemically bonded to the tooth. Amalgams are not. They are held in place due to a physical retention. This means that after the dentist removes the decay, he also has to remove additional healthy tooth structure in order to create the proper undercuts and retention grooves to hold the amalgam in place. This process leaves less remaining tooth structure. The good thing is that amalgams usually lasts for a really long time. The bad news is that when they do wear out, they tend to cause larger problems because there is less tooth structure remaining to work with. 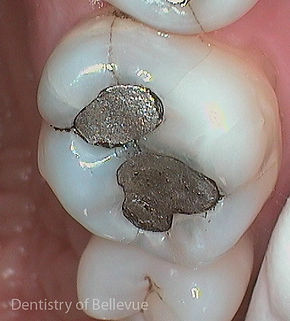 That is why it is common for a very large amalgam to be replaced with a crown. he/she removes other than the decay. This could mean that years later when the composite filling eventually wears out, hopefully another larger composite filling can be placed, rather than a crown. Another common issue is that teeth with old amalgams tend to develop more cracks. Because the amalgam filling is not bonded to the tooth, the enamel surrounding the filling is unsupported. Over time, that unsupported tooth structure microscopically flexes when stress is placed on the tooth. Years of this flexing can cause cracks to form. These cracks can lead to more extensive (and expensive) treatment, such as a crown, a root canal, or even loss of the tooth depending on the severity of the fracture. Whether you have composite or amalgam fillings it is important to maintain your regular cleaning and check-up appointments with your Apex dentist. He/she can keep you informed about the condition of your fillings. That way when one does wear out (and they will, because unfortunately no dental work lasts forever), you can be pro-active, which typically leads to a less expensive and more conservative outcome. Have you ever had dental pain or discomfort when biting into food or after eating/drinking something that is hot or cold? This pain or discomfort might not be constant like it is with a cavity, but intermittent. If so, it is possible you may have a cracked tooth. If the crack in the tooth does not extend further than the enamel, your dentist may not recommend any treatment. These cracks, known as craze lines, are common in adult teeth. Think of a teacup with a crack in it but that is still able to hold water without it leaking. However, if the fracture extends beyond the enamel, it is very important to have the tooth treated. In this situation we have a leaky teacup! It can be difficult for patients to distinguish between the different types of cracks, so it is important to visit your Apex dentist so the fracture can be properly evaluated. Try to pay attention to exactly where the pain is coming from so that you can tell your dentist. Molar are more vulnerable to cracks because they absorb most of the impact when chewing food. Front teeth are more commonly fractured due to trauma. Your Apex dentist will determine a treatment plan based on the severity of the fracture. 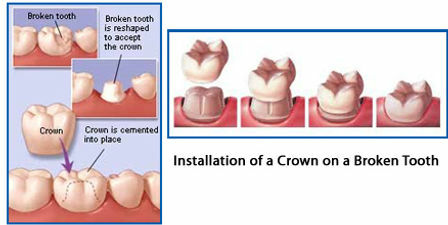 Treatment typically includes placing a dental crown on the cracked tooth. If the fracture effects the pulp chamber a root canal may also be necessary. If the tooth is split beyond repair, an extraction is likely necessary. In this situation tooth replacement is possible with implants or bridges. Postponing treatment can lead to more serious complications such as an infection or a deeper fracture. That is why it is important not to ignore warning signs or dental pain and sensitivity. By seeking treatment early, there is a typically better prognosis for the tooth. which also usually results in a lower financial cost of treatment. You should feel like your dentist gives you a customized dental experience. Not a one size fits all appointment. This can only be done if the dentist takes time to not only look in your mouth, but to listen to you. The dentist might be an expert on what is going on in your mouth, but you are the expert on why. What’s is going on in your life and how is that effecting your overall and dental health? Are you a mom who is busy doing a fabulous job taking care of your children but tend to put yourself on the back burner? Are you a bride preparing for your wedding and want the best smile of your life? Did you just get your first job, have dental insurance for the first time since before college and want to get back on track? How do you feel about your smile? If there is something you could change about your smile, what would it be? Your dentist should be interested in you. Not just your mouth. A dentist should not keep you in the waiting room too long and should be punctual for appointments. Scheduling coordinators should give you options for appointments that are convenient for you. If taking off work is difficult, find a dental office that offers appointments on Saturdays or late weekday hours. A dentist should also offer different billing options so that your financial resources can be optimized. For example, hopefully they file your insurance, have financing options, and/or offer a cash discount if you are a cash paying patient. The entire dental team should be good educators. The dentist will educate you on all matters related to your oral health and how it effects your overall health and well being. This includes performing oral cancer screenings as a part of a head and neck exam. The dental hygienist should educate you on what you can do daily to keep your teeth healthy and maintain your smile. Insurance can get confusing. What you will pay, what insurance will pay? Do you pay up front? Or only the difference? The financial coordinator’s job is to help you understand all aspects of your financial arrangement. You wouldn’t use a phone from 15 years ago. So why go to a dentist who does not stay up to date with current technology? Advancements in technology in the dental field offer many of the same benefits as those outside the field. More comfort, less time, better results. For example, same day CEREC crowns mean less wait time for patients. They also mean no annoying temporary crown while you wait for the permanent one to come back from the lab. Continuing education allows dentists to stay current with technology and procedures. It gives them an opportunity to brush up on procedures they are already comfortable with and expand their scope of practice. Not sure what your dentist does to stay up to date? Just ask! If your dentist is already doing this, he/she would most likely love the opportunity to share this information with you! Overall, just remember to trust your gut. Taking some time to find a dental practice that meets your specific needs is worth the effort. Perhaps that means calling to ask for an office tour and to meet the dentist and staff before scheduling your first appointment. Once you find the right fit, you will be glad you did! We have been asked this question a lot lately, maybe because it is summer and people are looking for a cold refreshing alternative to water that is not soda or juice. I mean, who doesn’t love a Coconut La Croix every now and then!?! Unfortunately the answer is True. The problem is that the CO2 that gives sparking water its fizziness is converted to carbonic acid in your mouth. This acid lowers the pH level and while buffers in our saliva work to neutralize pH levels, the process is slow. What happens in a mouth with a reduced pH level? Teeth are demineralized. In other words, the hard enamel that protects the soft inner part of your teeth (dentin) literally looses some of the minerals that make it hard. When the enamel is soft, dental erosion occurs…even in the absence of sugar. Adding sugar to the equation creates even more of a problem. This is because your teeth are not only at risk for erosion, but decay also. So while sparkling water is worse for your teeth than regular water, it is not as bad as non-diet soda. La Croix and drink it with a meal over a 15 minute time period, that is not so bad. Swishing with a mouthful of regular water when you are done makes it even better. However, if you sip on that same size can, without food, for over an hour, the exposure time is much higher. Your saliva just can’t keep up and so more erosion will occur. Bottomline: The best thing you can drink is water. When you drink other beverages, try to consume over a shorter duration of time, rather than sipping throughout the day. If you drink something acidic, don’t brush right away, as the enamel is soft and you will be literally brushing away your teeth! Instead, rinse with water and brush with fluoride toothpaste an hour later. The goal of this post is not to say that sparkling water is horrible and you should never drink it. After all it is a more “natural” alternative to soda and does not have any sugar. However, when a bottle of sparkling water looks almost identical to a regular bottle of water it can be hard to tell if there is any difference. And it is important to understand the difference so that we can enjoy these beverages and then take the necessary steps to keep our teeth healthy and strong! What an exciting Month at Hansen Dentistry! I enjoyed meeting everyone who came to the office during the last week of May and the month of June. Building relationships is the best part of my job as a leading dentist in Apex. I feel incredibly blessed to have the opportunity to be your dentist. After years of looking for the right practice to join, I know I have made the right choice coming to Hansen Dentistry. Several patients have asked how we came to find out that the Simpsons were selling their practice. My family and I go to church with the Simpsons. They actually approached us when they heard that were looking for practice purchase opportunities. So we kind of feel like they hand picked us! As you might imagine, because Apex is such an amazing, incredible place to live, opportunities in this area are not too easy to come by. But it was when I saw how Dr. Simpson’s attention to detail mirrored my own, that I knew it was a good fit. There have been some exciting changes too! We have a new website, and a new logo. changes around the office. A little paint and new lighting…did you know I was an electrician before I went to dental school? We are also now in-network with most insurance companies. More on this to come. it is just more convenient. And I guess another change is this blog! This is just the first blog post so I will keep it short and sweet. We will be updating regularly with educational posts and fun posts to share about what we are doing at the office. We would love any feedback from you. If there are topics that we can cover here to help you better understand your dental health, feel free to comment or call us! Thanks for a great first month! Happy Independence Day to you! How blessed we are! @ 2019. All Rights Reserved. Hansen Dentistry.